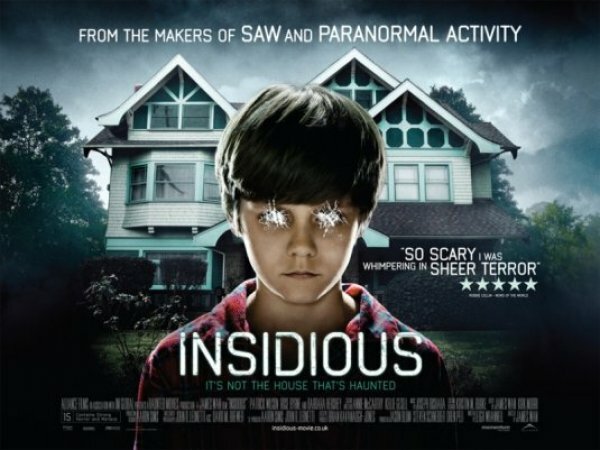 Insidious follows a family moving into a spooky new home. Soon after moving in, their son looses consciousness in the attic, and won't wake up. His family takes him to a doctor but the doctor is unable to provide any help, saying the boy is not technically in a coma. At first it seems as though the film is going to follow the standard formulaic approach to Haunted House flicks, and definitely skirts the average cliché’s but does its best to subvert them along the way. With some fresh ideas and some not so fresh twists, it works the majority of the time but falls flat in some scenes. The parents, as so often are the case in these films, are central to the plot and hence in many ways are the heart of the movie. The good news is that both Patrick Wilson and Rose Byrne are excellent in this film. They both give solid performances and even when the script turns to cliché’s or is un-believable they keep the movie on an emotional level of realism that is vital to the success of 'Insidious’. When the real creepiness starts, it gets bad fast and doesn't get any better when the family moves into a new home. They're introduced by Patrick's Mother to an old friend of hers, who remembers Patrick... but Patrick doesn't remember her. What follows, is a very creepy séance, and a slightly less creepy Astral Projection into the spirit world. Towards the end of the film, the plot switches gear’s (again) as the father and son are pursued by what looks like Freddy Kruger in Pan's Labyrinth. It all comes together rather well, to a satisfactory ending, unfortunately the ending is tainted by a needless twist that seems tacked on but surprisingly doesn't ruin the film as a whole. James Wan demonstrates great cinematic techniques throughout 'Insidious’. He isn't afraid to linger in moody rooms, and the camera moves through the film with great ease and a strong artistic eye. The camera does make great use of space throughout both homes, but the shots never became gratuitous or jarring. The Director seems to have buried a lot of eerie images throughout, which even a keen observer, would be apt to miss several Ghosts hiding in plain site. Color wise the movie is easy on the eyes, and has a strong pallet. While the lighting is ominous it has little sense of subtlety, which at times seems to be a bit overwhelming. Musically the film's a cut above most modern horror films, with a few highlights. Both pre-recorded and a score composed specifically for the film come into play throughout and both have a wonderful sense of atmosphere. Especially notable is the unnerving opening credits, and very effective use of Tiny Tim's "Tip-Toe Through the Tulips" certainly go a long way to achieving the desired atmosphere. The Digital Effects are for the most part seamless, besides a couple slips later into the film. The Cosmetic Effects are all superb creating a wide array of disturbing ghosts, and one almost out of place Cloven-Hooved Demon. Overall the special effects are solid, but aren't enough of a focal point to seem overbearing to the film's content. Insidious is a creepy little movie, that’s propensity to paint by number is saved by the writer's styling, creativity, and tendency to subvert cliché’s as much as possible. Filled with strong performances and direction, it's effective but it's urge to shock ends up being its own undoing.